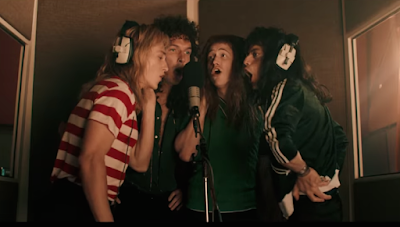 Bohemian Rhapsody is an exploration of the lives of one of music's greatest, most unique bands, Queen, with a particular focus on its lead performer: Freddie Mercury. 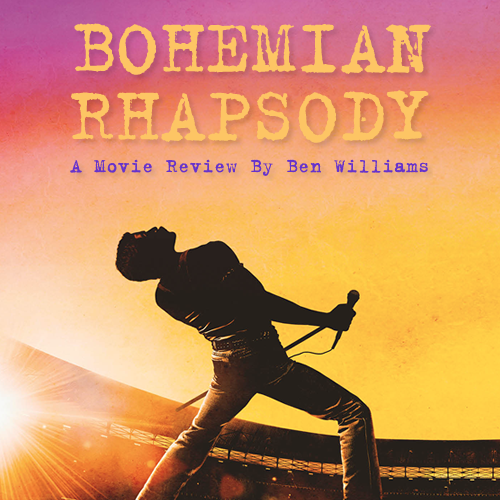 While it's a fantastic showcase of hit Queen songs and what may be an iconic lead performance, the film itself is anything but unique, following the tired formula of every music biopic you've seen before. Journeying from his humble beginnings working at Heathrow Airport in 1970 to his peak at 1984's Live Aid, the spotlight is on Freddie Mercury as he and the rest of Queen dominate the world of rock and roll. 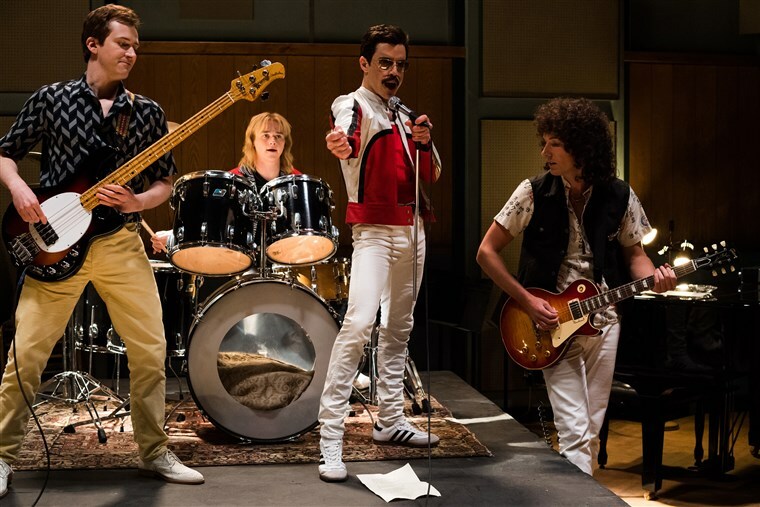 The film is approachable to Queen fans new and old - from never even hearing of Queen to having "We Will Rock You" tattooed on your elbow, anyone will be able to go into this and be thoroughly entertained... mostly because of actor Rami Malek's portrayal Mercury. While other members of the cast are great, including an unrecognisable Michael Myers in a small role, they all feel like place holders in comparison to Rami Malek. An actor's portrayal of a non-fictional character can often get lukewarm reception, coming off as more of an impression rather than embracing the figure they're pretending to be. Malek's is on the other end of the scale: literally becoming the character. 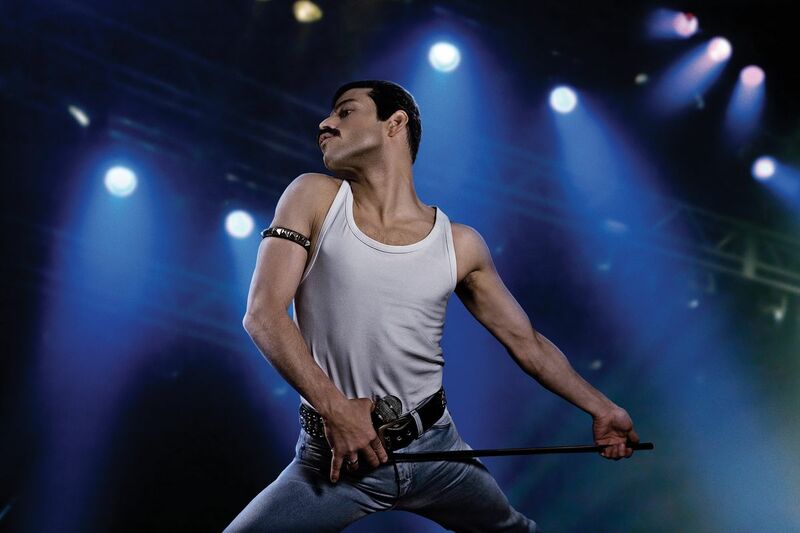 Perfectly capturing Mercury's teeth-licking, eccentric flamboyancy isn't the only reason Rami Mercury is an Oscar-worthy performance, he also nails the larger-than-life personality that Mercury used to mask his inner turmoil. Rami's performance should be shown as an example to acting and film school students for years to come as a demonstration of how he raised the bar of what people should expect from a biopic lead. He goes from being determined to reach his potential, making his mark on the world, to struggling with figuring out who he is and wondering if he's satisfied with the answer. It's a story that goes surprisingly deeper into the darker side of Mercury than casual Queen fans may have expected, but I'm glad it did. It achieves what a lot of biopics aim to do: getting the audience to know the subject better, which in turn gives them the urge to research further after viewing and learn more about the things that the film couldn't show or didn't have the time to. However, this can be a double edged sword, as the film itself didn't go nearly as deep as it could have. 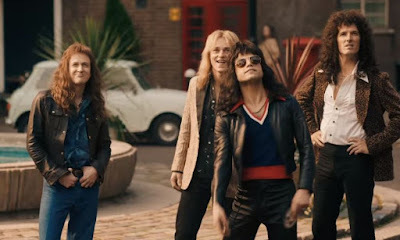 Although there's a big focus during the second act on Mercury struggling with his sexuality (especially during his tour in America), a lot of these instances are often brushed over, merely implying that he's been shagging a lot of guys, hurrying the plot along for the sake of a PG-13 rating. For a film that's expected to cover the pain a man has felt throughout his life, I'd have gladly taken a R-rated Freddy Mercury film with a rougher structure. One that really gets into the grit of being torn between two worlds. It would've given a much better essence of the conflict he felt through all those years. Malik flaunting his talent throughout Bohemian Rhapsody's spanned 14 years is a gem that's of course only matched by the music. 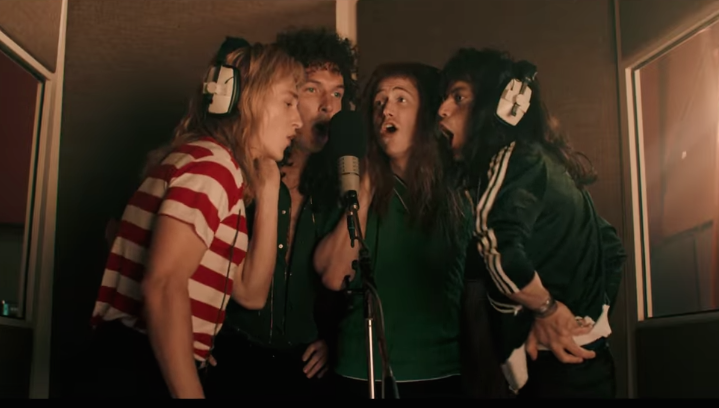 The film's best scenes are when the whole of Queen are on a session of song writing discovery or conflict, thinking of new ways to improve their music which turn out to be the origins of an iconic song. Whatever they're arguing about is thrown into the background when one realises something that might make their music better. It's impossible to not smile at these musicians having fun as they create new songs or play them in concert. Somebody to Love, We Will Rock You, Another One Bites The Dust, Fat Bottomed Girls: listening to takes of Mercury's original recordings, mixed with soundalike Marc Martel, added to Malek's passionate physicality with each performance made me feel like I was listening to these songs for the first time. On the other hand, it's disappointing that they played it safe. The set list for the film is mostly made up of the same songs you've probably heard at every pub's "rock night" in the last fifteen years. They're great, yes, but a film based on a band that released over 150 songs could have at least thrown in some of the lesser known ones, giving casual audiences something they haven't heard before to really enhance the experience. Furthermore, most scenes featuring a concert performance are sped through in montages far too quickly. There's too many of these kind of moments, and they do nothing but make viewers think "I don't care about that manager story. Go back to singing and guitar riffing!". What truly stops this diamond in the definition of rough from being a priceless jewel is the absolute drag that happens with the obligatory "falls from grace" part of the story. As a part of one of many rewrites of true events, Freddie gets too full of himself, at the influence of an outside party, and isolates himself from his friends, crashes and burns, before realising he needs the power of friendship before everything's back on track as it should be. This kind of story arc should sound familiar too you as it's basically featured in almost every aim-for-success film you've ever seen. Shifting history around a bit to make a biopic more streamlined and easier to watch is fair enough but when a rewrite still leaves the film at 134 minutes and still makes it feel even longer, it'll make anyone sigh as they're debating whether to even give Bohemian Rhapsody a rewatch. Appropriate for the decades it's set in Bohemian Rhapsody is like two bumps of cocaine. You snort the first, feeling energised and revitalised by everything you're seeing, be it Rami Malek giving a career-best performance or one of the best playlists for a "get psyched" mix. Eventually the first instance of coke will make you crash hard, as does the end of the film's second act. You'll feel weary. Confused. Wondering how you got where you are. Just wanting to be alive again. Then you finally crawl over to that second bump. It gloriously charges through your nostrils. You are once again energy incarnate. You're doing mental backflips. The Queen Live Aid performance at the climax makes you feel the equivalent of riding a unicorn on a guitar-shaped road into the sunset. Bohemian Rhapsody could've been one great high of love, pain, excitement and acceptance. Sadly, that sweet, Class-A powder got diluted with the hazardous chemical that is a messy reworking of history into a generic plot. If you get the chance to watch it again, fast forward when you realise it starts to drag. Go straight to the build up to Live Aid. Treat yourself to that one great high.